Some time back I could lay my hands on a book titled-TRANSFORMATION OF THE HEART. After going through its contents I travelled down my memory lane on a soul searching exercise! joined the SSSIHMS in Aug 93 as one of the resident staffs ostensibly with the idea of qualifying as a Cardiologist, but now when I look back I appreciate that the benign influence of BHAGAWAN has wrought a dramatic change in my perceptions and attitudes to many aspects of my life and profession. Slowly but surely definitive answers sunk in to my mind. As long as one identified oneself with the work done, all these con­tradictions appeared very real and troublesome. With difficulty when one learnt to accept the fact that all of this is a mere drama directed by BHAGAWAN with us as actors with specific roles, the identification complex vanished and with it the conflicts. So like any drama there were assigned roles for the main hero, the side hero and the villains. One's iden­tity with the roles existed only as far as the duration of the drama. This brought about a major upheavel in attitudes to­wards everything in life. Surrendering one­self and carrying out the work as His mere instrument brought forth immense peace. Successes did'nt elate nor failures dissapoint. 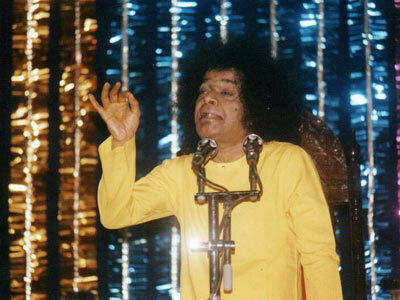 BHAGAWAN's message: "If you cant oblige, at least talk obligingly", struck a sensitive chord in my heart. 1 ? power of speech endowed by the Grace of God­dess Saraswathi was now used to charge every patient with positive vibrations. It was indeed a miracle to see that where medicines failed, tender, loving, reassuring words did the magic. Once all actions were surrendered to Him, no work was good or bad. Thus one could approach things with mental equanimity. With a string of personal reverses and setbacks I could have ended being a mental wreck. Surprisingly I discovered that acceptance of all things as HIS WILL erased all unpleasant memories and reinforced my resolve to see, hear, say and do good to one and all at any cost. I offer my humble prayers to Him to continue the chiselling so that hopefully one day I will be a fine sculpture worthy of being designated as His real devotee and disciple - an Arjuna to Krishna in Kali Yuga.